Simple is in our name, but our design department is anything but. Our designers approach each project from all angles and are experts in product development, graphics, engineering, and environmental architecture. Our design studio is full-service and in-house, from sketch ideations (we do many for each assignment) to precise 3D CAD renderings, our designers are talented and skilled in the latest software. We do mockups, and prototypes for most projects, and also provide additional design services like specialty renderings for use in marketing and sales presentations. 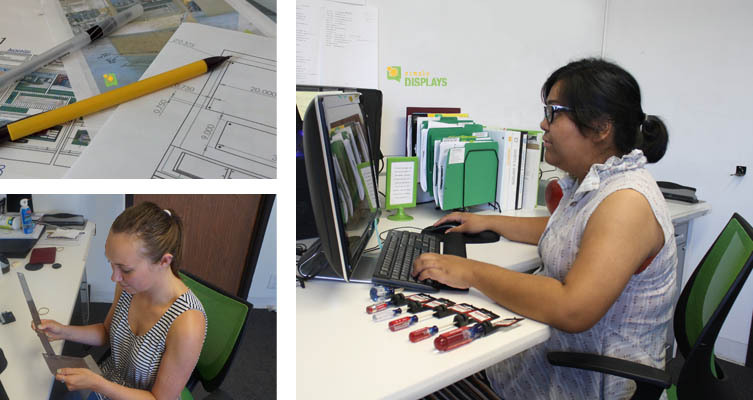 As a one-stop resource for creative displays, our clients use our design department as an extension to their own corporate marketing departments. Our creative team is always on the hunt for the latest in materials and techniques. As members of POPAI, AGIA, and RDI, we appreciate collaborating with other design firms both in and out of our industry. Our designers have brought in both Gold and Silver Awards from International design competitions, and are truly passionate about providing creative display solutions and increasing sales for our clients. If you need custom-designed point of purchase displays, request a quote today or contact Simply Displays to learn more.